Panaeolus papilionaceus is a "coprophilous" mushroom, which is nice way of saying it grows on, um, dung (primarily that of horses and cows) or in soil that has been enriched with equine or bovine blessings. 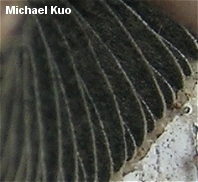 Aside from the habitat, identifying features include the black spore print; the gills, which are mottled gray and black; the tiny white partial veil fragments that hang like little teeth from the edge of the cap; the absence of a ring on the stem; and microscopic features (see below). 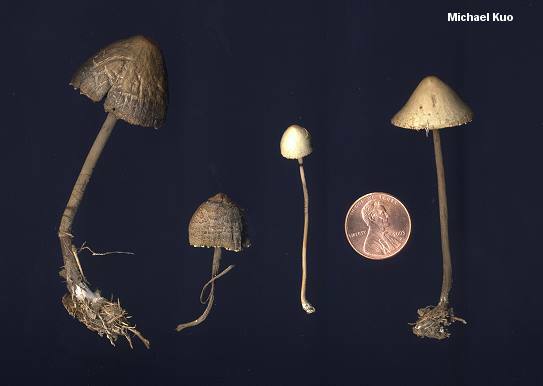 Panaeolus campanulatus, Panaeolus retirugis, and Panaeolus sphinctrinus are all synonyms; they represent taxa formerly considered distinct. Ecology: Saprobic; growing alone to gregariously in the dung of horses and cows; common; widely distributed in North America; spring, summer, and fall (and over winter in warmer climates). Cap: 1-5 cm; obtusely conical to bell shaped or nearly spherical when young, expanding slightly (often to broadly bell-shaped) with age; dry; smooth to silky when young, often becoming finely hairy or prominently cracked with age; sometimes with a reticulate network of raised ridges; whitish, gray, brownish, brown, or reddish brown; sometimes developing olive discolorations; the margin hung with white, toothlike partial veil fragments, at least when young (check this feature in the field, since the fragments are easily shed in collection bags). Gills: Attached to the stem, or pulling away from it with maturity; close or crowded; grayish when young, but soon developing black areas and acquiring a mottled appearance; eventually black overall; with whitish edges. Stem: 4-16 cm long; up to 5 mm thick; more or less equal; finely hairy; often brittle; colored more or less like the cap, but paler at the apex and darkening or turning reddish toward the base with maturity or on handling. Chemical Reactions: KOH on cap surface dull orangish. Microscopic Features: Spores 11-18.5 x 7.5-12 µ; more or less elliptical, with a pore; smooth; dextrinoid; not discoloring in concentrated sulphuric acid. Basidia 4-sterigmate; abruptly clavate. Pleurocystidia absent. Cheilocystidia abundant; subcylindric, often subcapitate or capitate. Pileipellis an epithelium, often featuring pileocystidia. REFERENCES: (Bulliard, 1781) Quélet, 1872. (Fries, 1821; Saccardo, 1887; Kauffman, 1918; Stamets, 1978; Smith, Smith & Weber, 1979; Arora, 1986; Phillips, 1991/2005; Lincoff, 1992; Metzler & Metzler, 1992; Barron, 1999; McNeil, 2006; Miller & Miller, 2006.) Herb. Kuo 07180204, 04160601.